While it’s hard to deny that sampling beer as part of a job isn’t great, there’s actually a lot to designing and activating a sensory program that relies on trained tasters to help keep our beers in-check. Each week, we run a series of sensory panels (blind tastings) to gain deeper understandings when it comes to our beers. 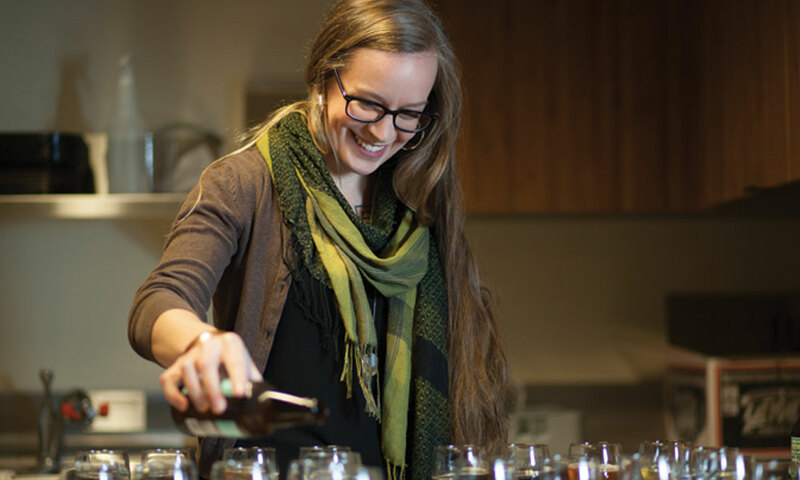 I sat down with Jules, our sensory specialist here at Ninkasi, and asked her some questions about the program and what it takes to be a great beer taster. How do you describe your role in the sensory program to someone outside of beer? I tried to design a sensory program that was able to meet the needs of our brewery – quality control testing, process change trials and testing, and new product development. Overall, my role is to help make sure the beers we make are hitting the flavor targets that we’re going for and that they are consistent from batch to batch. Specifically, I recruit and train our tasting panelists, design, schedule and run tests, manage the test data and generate reports, build out flavor profile on our beers, track all of our beers through production, and investigate anything that may be unusual about them. I work on process improvements with other teams and collaborate closely with my coworkers in our Quality Department to correlate my sensory testing to their analytical and microbiological testing. I work on selecting and tracking our raw ingredients and understanding their effect on our beers, maintain a library of all of our packaged beer over its shelf-life, and provide flavor profile information on new beers that we’re working on to help inform recipe development and changes. There’s a lot going on! What does it take to pull that all off? I’d say it’s helpful if you have a strong sense of sensory yourself. I was previously a sensory panelist and then job-shadowed with our previous Sensory Technician for a while. I also went through the BJCP Beer Judge certification and Cicerone® certification. I think it also helps to have a strong sense of the brewing process and fermentation and how different ingredients and processes come together to make beer. Then beyond that, you need to be able to train other people, be objective and create an objective environment, understand the needs and uses of the information that is being gathered, design and carry out the right tests given the questions that you’re trying to answer, and analyze the data in a way that makes sense. That’s a lot of training to get you here. What sparked your interest in sensory? I think I’ve always been very interested in flavor and the experience of eating and drinking. I draw a lot of enjoyment out of it personally, and have always tried to pick apart exactly what I’m tasting and smelling to figure out where each component of the experience is coming from. I love cooking, eating, and drinking and I’m usually thinking pretty actively about whatever I’m consuming. When I was a kid, I had a babysitter that created this game that she would play with my sisters and me: we would sit in the kitchen with our eyes closed while she gathered little samples of food from the pantry, cupboards, the refrigerator, etc. She would have us hold out our hands with our eyes closed and place a little bit of whatever the sample (for example chocolate chips) was in our hand. We would feel it in our hands, then smell and taste it and have to guess what it was. I loved that game. I guess it’s just an extension of a personal interest to want to engage with and teach other people to be able to have full sensory experiences themselves and figure out how to describe them. Of course, we put those skills to very practical uses in a formal panel setting at work. But you’re running the sensory panel at Ninkasi, not Toll House. How did you get started in beer? I started working in the Tasting Room here at Ninkasi not long after graduating from college. I studied romance languages with a focus in linguistics and wasn’t quite sure what I wanted to do with it yet. Before and during college, I worked for a number of years as a project manager at a polling research company that conducted market and political research and I was looking for something different. I was drawn to Ninkasi, partly because it was a brewery that made awesome beer and I was already a beer nerd at that time, but also because I felt good about working for a local company whose values I believed in that cared about giving back to the community that I lived in. Back then, the company was a lot smaller and I had the opportunity to cross-train in other departments a fair amount and learn a lot about brewery operations and beer. I also read about and studied beer pretty intensively and joined our first sensory panel that we had here at Ninkasi because I wanted to be able really understand what was going on around me and also be able to answer any questions that a customer may ask me. The combination of having the opportunity to continually learn at work and then spend my days talking about beer, describing beer and helping customers learn and figure out what they liked, all led to a pretty enjoyable work environment. When I first started working in beer, if felt fairly unrelated to what I had been doing previously, but considering how my job has evolved into what it is now, it all seems much more interconnected. I think somehow studying how language works helped me to be more comfortable figuring out how to put sensory experiences into the structure of a language. Working in polling definitely directly relates to understanding how to elicit specific types of information from how a question is formulated, how to create a good data collection environment that reduces bias, and then also, on the data side, the importance of group data – creating objective results from the subjective experiences of a person. As a chemist, I just want to look at the data and make a decision as to whether the beer is good to go. So why is sensory so important? Sensory testing measures the human experience. We make beer for people to drink and enjoy, so it’s pretty important to test how people are responding to it. It has to smell, taste and feel good and be able to be repeatable so that a customer can buy the same beer that they love again and again. We have many important methods and instruments for testing our beer all throughout its production, but it’s very difficult for an instrument to fully measure the flavor, aroma and body of a beer that a person will experience, and this is what sensory testing achieves. Next time, we’ll cover what the sensory panel actually is, some of the tests that are ran through the panel, and more on why panel members are such a crucial part of the brewery.